Whenever I go out to eat for the first time at a restaurant, I try to go when it first opens, to avoid larger crowds and tons of orders in the kitchen. Because I had the restaurant to myself, I felt more comfortable to talk to the staff, who were clearly knowledgable about gluten-free and vegan options, even going as far as to tell me that they love their special diet customers. How often do you hear that when you go out to eat? 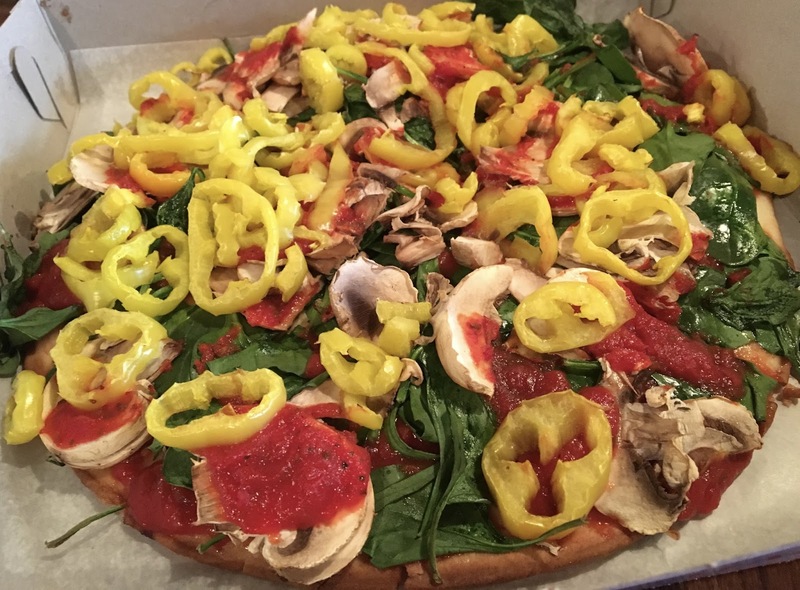 When it comes to gluten-free pizza, the only size option is the 10" personal pie. It's prepared using dedicated utensils and pan, and the staff will wash their hands before preparing it, as ht the kitchen is not dedicated gluten-free. 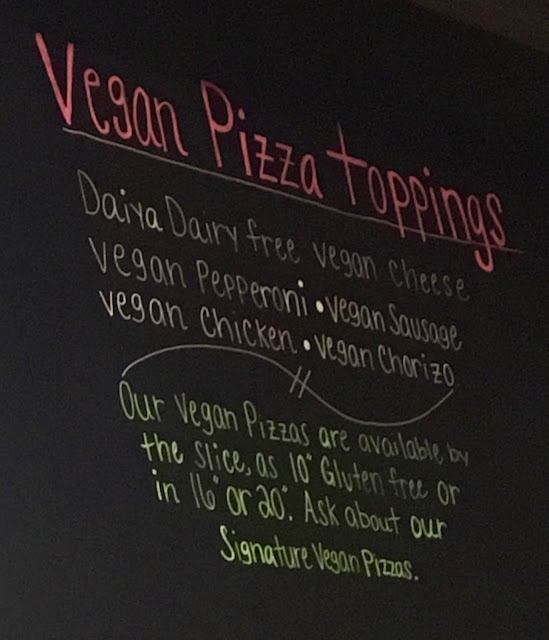 Note that the cheeses (Daiya and dairy-full) and red sauce used on gluten-free and vegan pizzas is segregated to prevent cross contamination, but the rest of the toppings are not isolated, so you have to decide for yourself if you are comfortable with them. 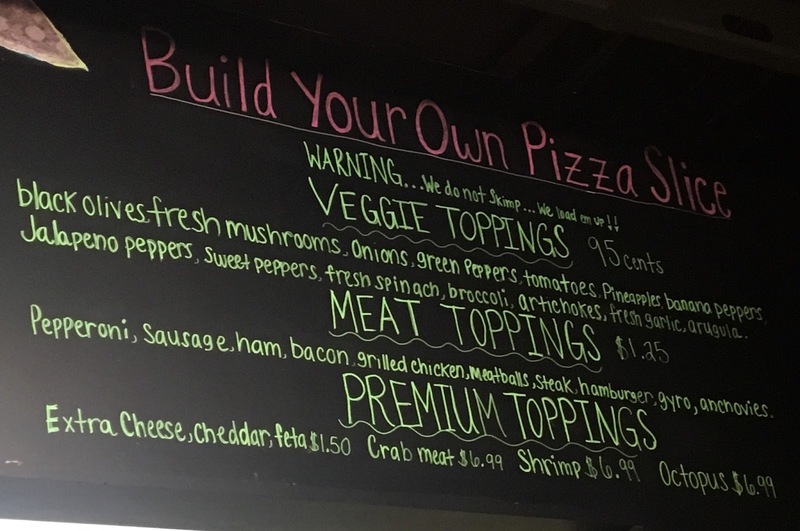 Do heed the warning on the menu to choose your toppings wisely, they do indeed load each pizza up. If you are vegan but not gluten-free, your options are a bit more plentiful, and you can choose from all of the pizza size options. I was impressed by the array of vegan meat options available. Because I was the only customer in the shop, I decided to go for toppings, because it was early in the day. As the day goes on, there will be an increase the likelihood of cross contamination because more and more pizzas would be prepared. I decided to top mine with banana peppers, spinach and mushrooms. The pizza came out quickly and when I opened the box, it was absolutely beautiful. Laden down with ample amounts of the selected toppings, the pizza certainly impressed me at first glance. Cut into four big slices, the thin crust was able to hold up under the weight of the toppings, and actually was notable for it's chewiness. The toppings, clearly fresh, were flavorful, but the surprise hit for me was the rich red tomato sauce, which was clearly prepared with care. I loved the chunks of tomatoes throughout, which proves that Slice on the Avenue is on it's game preparing quality pizza from the sauce up. Without sounding too cliche, Slice on the Avenue was a total hit out of the ballpark for me. Great tasting gluten and dairy-free pizza? Friendly, knowledgable service? Convenient location that can deliver right to my front door? Check, check, and check. I really don't have any complaints whatsoever, and am looking forward to enjoying Slice on the Avenue's fantastic pizzas for semesters to come. Yes, the pizza can get pricy when the cost of individual toppings add up, but I am more than willing to pay up for pizza I don't have to be scared of eating. 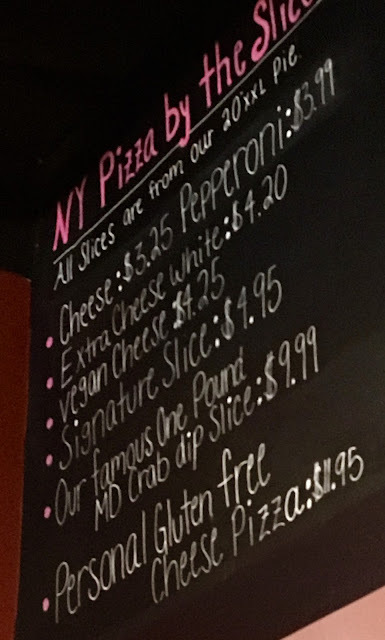 If you are in the Towson area, I definitely encourage a stop at Slice on the Avenue- it's quite possibly my favorite restaurant in Towson now. Special Features: Order them via Order Up Towson!